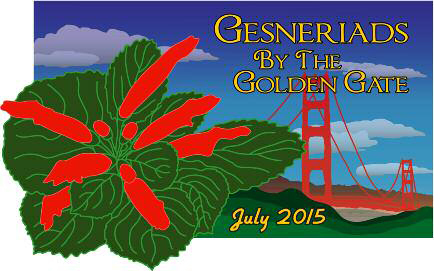 The San Francisco Gesneriad Society hosted The Gesneriad Society’s 59th annual convention in the San Francisco Bay Area at the Marriott Oakland City Center Hotel from June 30 to July 4, 2015. The local chapter members, organized by Alan LaVergne and his team, welcomed the 142 convention registrants, including 15 first-time attendees. The all-day pre-convention trip on Monday included a visit to the San Francisco Botanical Gardens (Strybing Arboretum and Japanese Tea Garden), lunch at the gardens, a photo stop at the Golden Gate Bridge, and a visit to Annie’s Annuals Nursery. Convention officially opened with the Board of Directors meeting on Tuesday morning followed by an afternoon group tour to the Ruth Bancroft Garden in Walnut Creek. That evening convention attendees mingled at the opening dinner and then attended a Growers Forum “Confessing Our Sinns” (Tuber Talk) and a discussion on Social Media. Wednesday brought judging school, a mini-program “Updates in Brazilian Gesneriaceae” by Alain Chautems, the GHA meeting and program with Dale Martens show-casing new hybrids, and the conservation meeting hosted by Stephen Maciejewski. The program included an update by Professor Wei on the GCCC followed by short talks on conservation activities in Brazil by Mauro Peixoto, in China by Hong Xin, in Ecuador by Mary Jo Modica, and in the Fijian Islands by Melissa Johnson. The featured lectures during the week were “Botanical Adventures in Colombia and Ecuador” by Ron Parsons; “Gesneriads with a Swedish Accent” by Lena Klintberg (and friends); “Take Great Pictures of Your Gesneriads” by Julie Mavity-Hudson; and “Brazil Plants and Plants in Brazil” by Mauro Peixoto. Mini-lectures were presented on a variety of genera (Drymonia, Resia, Cremospermopsis, Gesneria, Cyrtandra, and Primulina) by the five students who had been awarded Society grants to attend convention this year. The flower show featured 178 high-quality entries from 33 exhibitors. Images and a list of all winning entries will soon be available (click on the first two links on the side-bar). You can also see other images of the convention activities and attendees. Whether you were unable to attend convention this year or would like to re-live the experience, you will be able to order the 2015 Convention DVD (available later in the year). This DVD will include PowerPoint presentations of the flower show and most all of the programs and lectures, along with images of the people and places that were a part of Convention 2015. The convention was brought to a close on Saturday night with the hosting San Francisco Chapter social held on the 21st floor of the hotel where attendees watched the surrounding area Fourth of July fireworks from on-high, relaxed, and just enjoyed each other’s company. Our time spent in the San Francisco Bay area was over, but we hope to see old friends and new again next year at convention in Wilmington, Delaware, from July 5 to July 9.